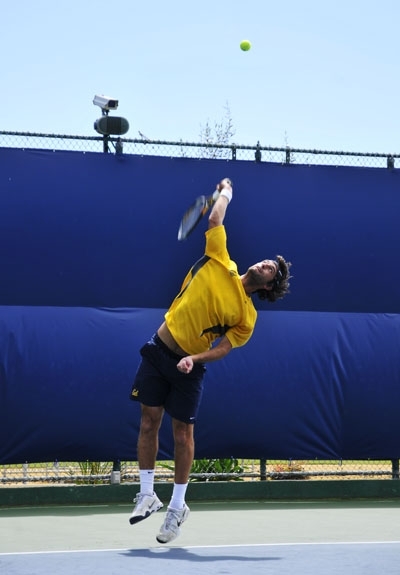 As he was walking onto the courts at Hellman Tennis Complex, Cal men's tennis coach Peter Wright said aloud to himself, "Okay, we got work to do." Considering that the dual season officially ended last weekend, an outsider might think that Wright's declaration came a few months too late. But this is when hard work matters most. Wright and his team are in their element, preparing for the NCAA Championships. But before the No. 16 Bears reach that point, they must first contend with this weekend's Pac-10 Championships, which begin today in Ojai, Calif., at the Ojai Valley Tennis Club. Cal is the first to admit that the Pac-10 tournament is not a top priority. "The results aren't important," Wright said, "but playing in the tournament is." The players won't be playing for team glory; all matches in the singles and doubles tournament are individual. Moreover, rankings aren't heavily affected and the players who take the crown aren't even guaranteed a seed in their respective NCAA event. What's important is preparation for the NCAA tournament, which begins May 13. The team will use this weekend's matches as a way to fine tune its doubles lineup and get in some valuable live matches. "I wouldn't say we're overlooking matches," junior Sky Lovill said. "But we're just trying to get better and better. We're ready to make a postseason run." The Bears plan to capitalize on the opportunity by sending out four doubles squads that are entirely different from the regular lineup used in the dual season. In addition to doubles, each of those eight players will compete in the singles round - an added bonus for seldomly used singles players like senior Zach Gilbert, junior Tommie Murphy and Lovill. "This is a chance to really focus on what we've been working on and to build confidence," Wright said. "It's important to come back energized for NCAA." Pedro Zerbini will have plenty of energy for the NCAA championships. The Bears' senior captain and top player will sit out, rather than risk injury. Sophomore Carlos Cueto, who generally plays on court No. 2, won't be competing in Ojai this weekend either, nor will freshman Ben McLachlan. But Cal isn't entirely throwing away a perfect opportunity to practice. This probably won't be the last time the Bears battle their conference foes. Cal could face at least one of them again if it makes a deep run in the NCAAs. As far as preparation goes, the eight players have been improving serving accuracy and doubles strategies throughout the week. Players have been working on refining particular skills. For instance, Murphy worked on his serve on Wednesday while his teammates practiced points play. After all, the Bears still have plenty of work to do. Annie Gerlach covers men's tennis.